In the previous post we started to unravel the vCSA and discussed topics like the Appliance shell, the file system and the services. In this post we will continue with the vCSA Health. Knowing the health of your system is important. Like the Windows vCenter Server, the vCSA is also able to report its health. 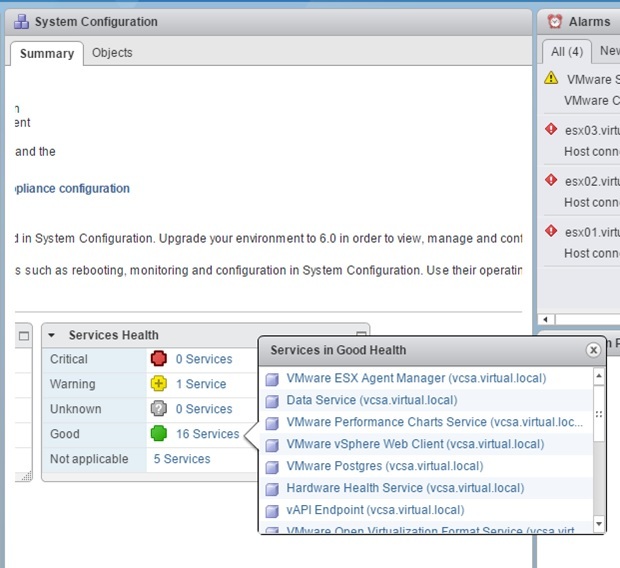 Most common is using the vSphere Web Client and from the main menu, choose: System Configuration and watch the “Service Health” pane. Detailed information can be found by clicking on the various Services. In the Bash shell, you can browse to the folder: /etc/vmware-sca/health/. On a vCSA 6.5, you will only find the first file. The vCenter Server Appliance is the new vCenter Server. In the old days, we had a brand new Windows Server on which the vCenter Server was installed. The necessary database server was quite often an external MS SQL database and sometimes an internal database. In the those days, tweaking the Windows Server and the installed components was more or less a common practice, due to the familiarity with Windows. But now the vCenter Server Appliance (vCSA) is the new and preferred standard. The vCSA comes as a virtual appliance and is ready to run within minutes compared to the old vCenter Server. Although a (virtual) appliance still means; (virtual) hardware, an operating system, middleware and applications, VMware likes to treat the vCSA as a “black box”. Like most appliances, the operating system is a Linux flavor and you can log in. After a successful log in, you will encounter the first discouragement; you are not welcomed by a Bash shell but with the default “Appliance Shell”. For more information read my post on the vCSA shells. In this post, a brief introduction on the following topics; Appliance shell, File system and the Services. You are currently browsing the Adventures in a Virtual World blog archives for July, 2017.